It’s been awhile since I’ve shared some house updates! 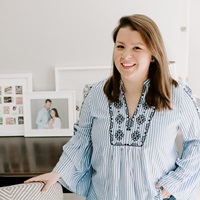 In general a lot of our home improvement projects slowed down after I got pregnant — not being able to paint has put a damper on some of my DIY abilities. 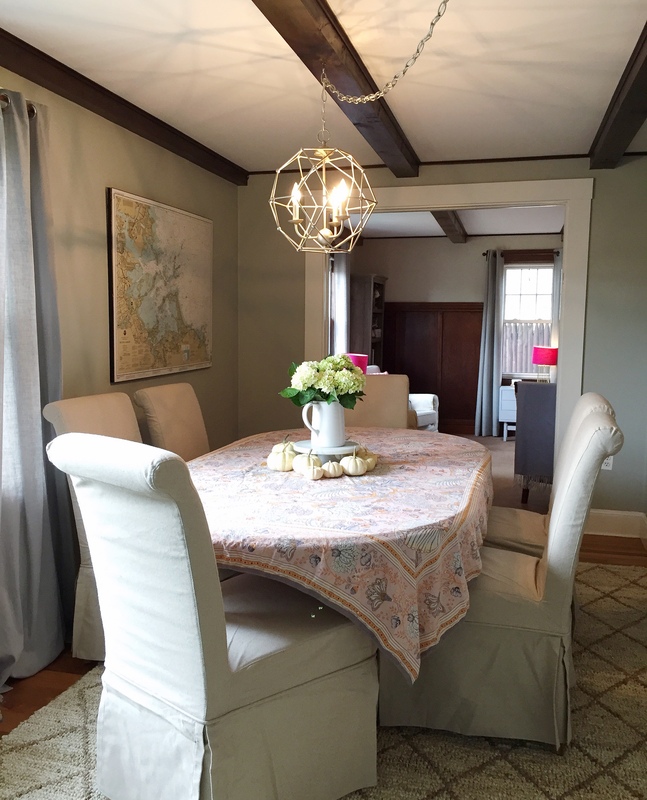 One room that has gotten a bit of a makeover since we moved in that I’m excited to share today is the dining room. We painted the dining room, and removed all the doors that close it off from the kitchen and living room only a few months after moving in. After that, we just popped in some hand me down furniture and craigslist pieces from our apartment and walked away. With the holidays coming up, I really wanted to “finish” this space and have it be a place where we could entertain friends and family. Of course no space is ever really finished, but we did tackle a few improvements to give it a fresh look. One of the major improvements we made was updating the lighting. The room had a terrible flush mount fixture that was completely off center in the room, and no where near the actual dining table. I scoured our Home Goods lighting aisle for months until we found this interesting geo-shaped light fixture for a total steal. My handy husband wired it up to where the old light fixture was placed, and then added a hook above the dining room table so we could swing it over the center and have it be a focal point in the room (and because we like to keep it real here: it wasn’t exactly a 5-minute project, we did have a few hiccups installing it, and I’m super grateful to him for all the work he put into hanging it in the perfect spot!). It made such a huge difference and helped bring the room from 1976 to 2016! The other big adjustment we made to the room was scrapping our old chairs from craiglist (they went right back on craiglist and off to another home, which makes me so happy), and replaced them with some neutral slipcovered dining chairs from Raymour and Flanigan. My number one requirement when looking for dining room chairs was comfort, I want people to sit down for dinner and not want to get up until you’ve lost track of time and realize every last wine bottle has run empty. When my sister recently walked into the dining room she said “wow, this is like grown-up furniture” and I giggled because that’s exactly how I feel about them! 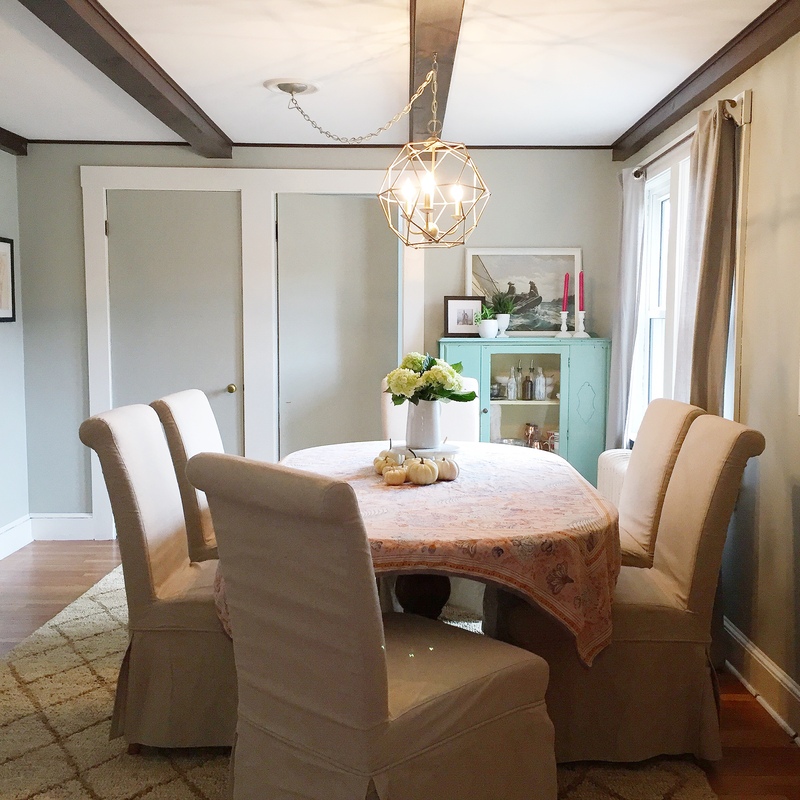 The room is still casual and approachable — no stuffy formal dinners here — but the chairs transformed the room into an “adult” dining space that feels miles away from our craigslist kitchenette of apartments past. We paired them with a wooden table that my parents handed down to us, which I always top off with a fun tablecloth for more color and texture. Another major update for the room was getting durable, yet lush feeling carpet to soften up the wood floors. We got this awesome textured rug from Raymour and Flanigan that has a similar natural color the chairs with a subtle diamond pattern in that really elevates the space. 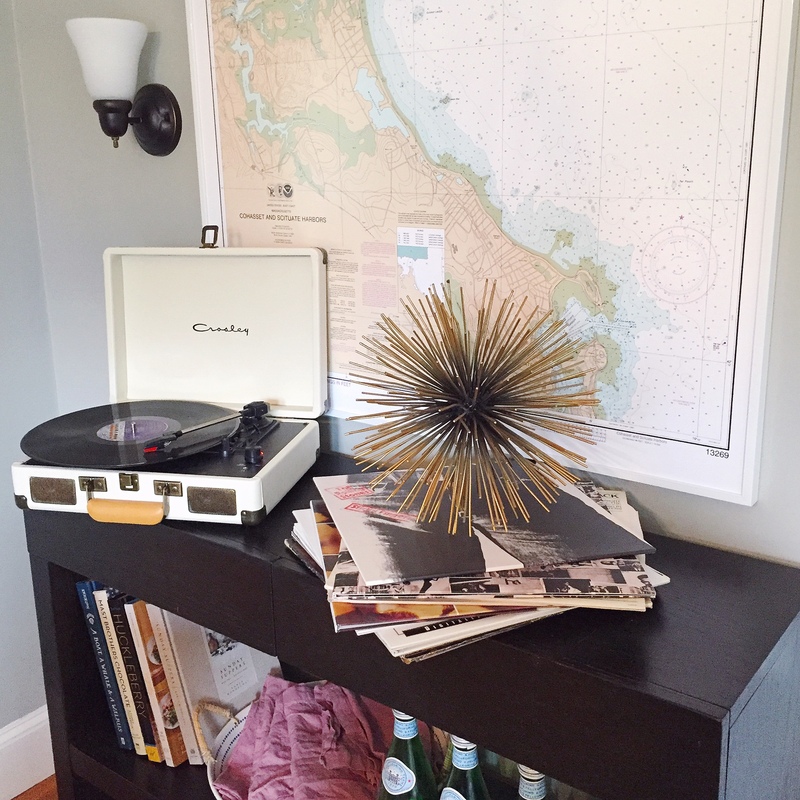 A few other repurposed vintage pieces from our old apartment are tucked into the room to hold my record player and some entertaining pieces, we even reused the curtains from our old apartment bedroom. 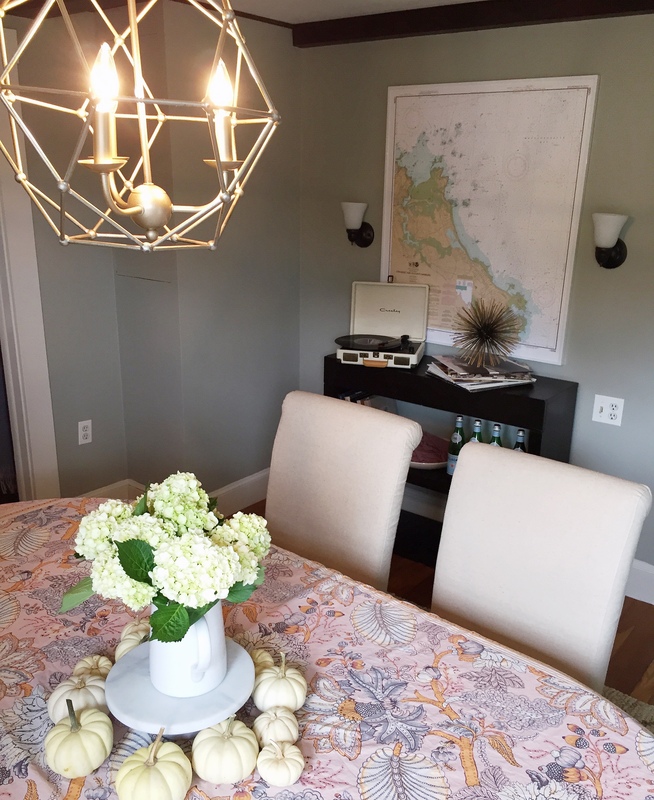 To fill the walls, my husband found some nautical charts of the harbors near our home and we had them framed — they’re quite inexpensive and make a big statement on the walls, and I love how the colors work with the new wall paint (Horizon Gray c/o Benjamin Moore). 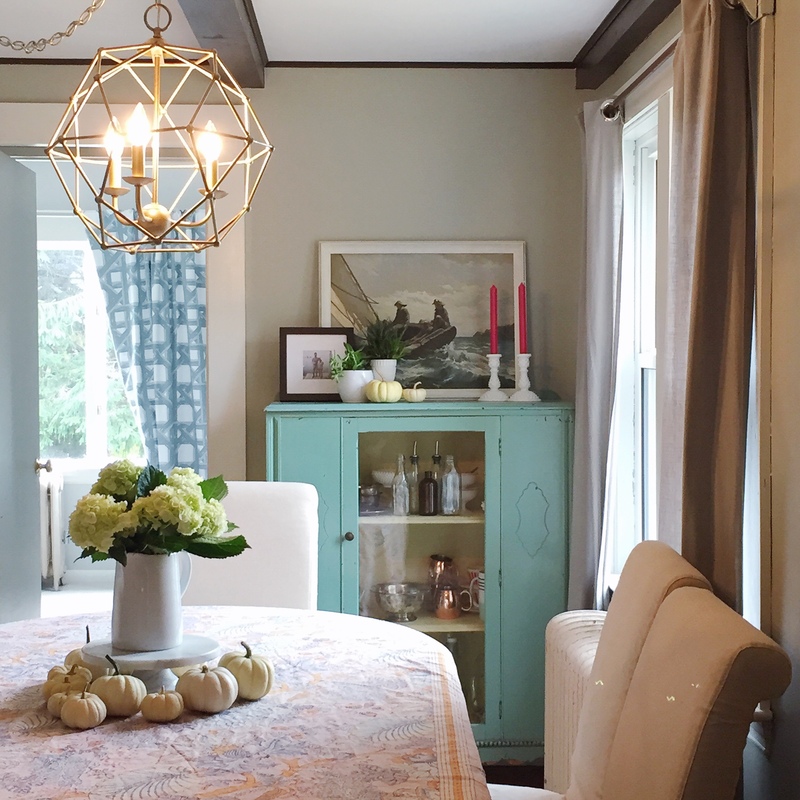 I’m so excited with how the space turned out, and can’t wait to host more dinners around the table in our refreshed dining room. Please note: This post was created in partnership with Raymour and Flanigan, all opinions, images, and content are my own. Creamy Autumn Squash Soup. 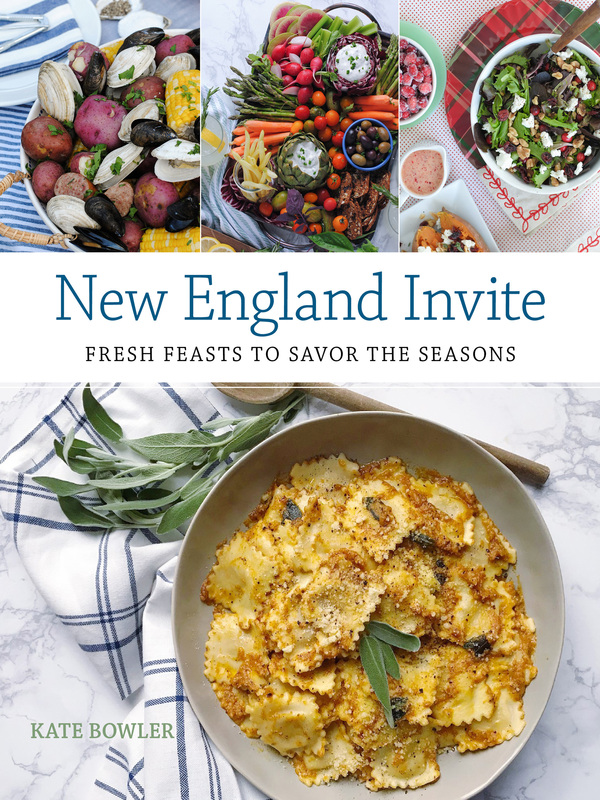 New England Babymoon Ideas. One Response to "Dining Room Updates." we have horrid lighting in our place too and chipping away at buying new. didn’t know home goods had lighting! gotta take a peek there.